Kia has launched its Optima PHEV, marked as the brand’s first plug-in hybrid. Priced at £31,495 including the Government’s £2,500 plug-in car grant, the Optima PHEV brings up to 33 miles of all-electric range at speeds as high as 75mph, with 0-60mph acceleration in 9.1 seconds in hybrid mode. It also offers CO2 emissions of 37g/km and fuel economy of 176.6mpg in the official NEDC combined test. The Optima PHEV combines a 154bhp 2.0-litre direct injection petrol engine with a 67bhp electric motor powered by a 9.8kWh lithium-ion polymer battery pack, generating a total 202bhp. Technologies include regenerative braking, a driving style guide, an ECO-DAS (ECOnomy Driver Assistance System) featuring Coasting Guide Control, a Drive Mode Select button so that drivers can personalise the powertrain’s dynamics, and an HEV (Hybrid Electric Vehicle) Select switch – which gives a choice of two driving modes. It also has an intelligent heating, ventilation and air conditioning (HVAC) system to save battery power. This is adapted from that in the Soul EV, and permits only the driver’s side of the car to be cooled when the other seats are unoccupied to minimise energy usage. 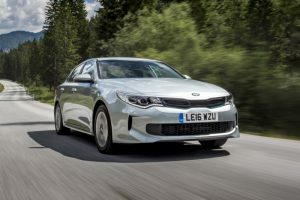 Kia also highlighted that the Optima PHEV is a unique standalone model within the Optima range and brings bespoke styling features including the active air-flap grille and a blue tint to the headlights plus comprehensive equipment including an 8.0-inch touch-screen navigation system with European mapping, Android Auto and Apple CarPlay (available later in the production run), Kia Connected Services powered by TomTom, a wireless mobile phone charger, a 270o around-view monitor and a 10-speaker harman/kardon Premium Sound audio system with Clari-Fi technology.